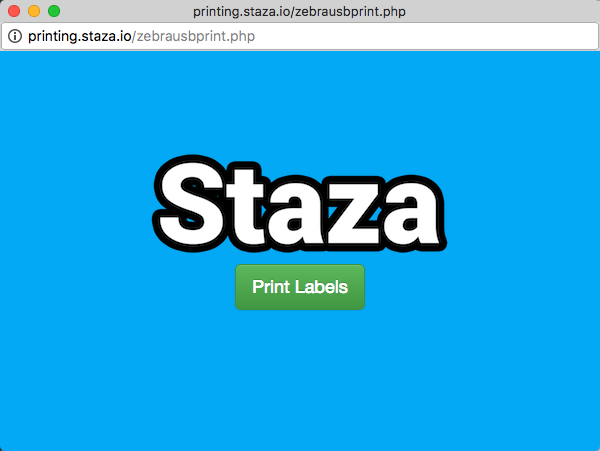 The Staza app has been pre-configured to print barcode labels from all of the most common label sheets, as well as rolls from Zebra printers. Pro Tip: Prior to printing labels, you'll need to upload tasks for the job. You can find instructions here for that. 1. [This is only required if using a Zebra printer.] Ensure that you have mapped your Zebra printer. Please refer to this help document for these steps. 2. [This is only required if using a Zebra printer.] If you're using a Zebra printer, open the Zebra "Browser Print" program on your computer. This program should remain running in the background whenever printing Zebra labels. 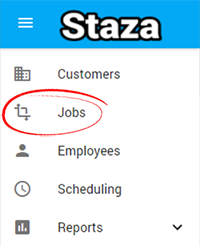 3.Open the Jobs list by selecting "Jobs" from the left menu navigation. 2. Find the job you want to print labels for and click the "edit" icon to the right of the job. 4. Select you preferred label size. The website has been pre-configured with the most comment sheet label sizes and Zebra label spools. To by selecting on an option, information on the label size as well as a label sheet image is displayed. Pro Tip: You can edit the number of sheets per employee (for sheet labels) or labels per employee (for Zebra label spools). The number of expected labels is displayed in the lower right of the screen. 5. Click "Print" to print the labels. For sheet labels, a PDF file will be generated which can be sent to your printer. For Zebra labels, the labels will automatically start printing to your mapped Zebra printer. Additional Option: Click "Print Blanks" to print blank barcodes. Staza has also been setup to print blank barcode labels. Blank barcodes will have no employee or origin/destination information, just a barcode.